RF Substrate Bias Considerations : Manitou Systems Inc. 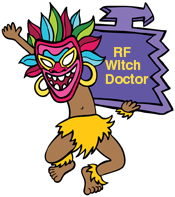 This page of the RF Witch Doctor Chronicles provides a look into adding an RF or DC Bias Feature to your new design or existing plasma processing system. When should DC or RF bias be used ? RF power may be used with both insulating and conductive substrates. DC power is only used with conductive substrates. The amount of substrate bias needed for a process depends on the quantity of ions arriving at the substrate’s surface – the bias will serve to increase the impact (accelerate) the ions. The DC bias power supply should include voltage control and current limiting along with arc detection and limit. The RF bias supply may be a simple low power RF generator & impedance match – the Model PB3-100 for example – and include an RF output power level control. Additional and desirable features include both RF power and developed DC substrate voltage control. What is the typical and maximum RF power level to power a substrate stage sputter etch (clean) & RF bias ? A sputter etch process will always require more RF power than an RF bias (only) process. The substrate stage and its components will need to withstand the higher RF power and current flow – resulting in higher heating of the stage’s components. Which RF Power control mode is used during the RF bias process ? An RF power generator can be set to either Forward power control (leveling) or to the DC Bias control mode. The RF control mode will maintain the Forward RF power level – while the developed DC bias level may vary based upon changes to the substrate’s surface or changes in the overall process conditions. The DC Bias control mode will maintain the Developed DC bias level (and allow the Forward RF power level to vary) during the process. Remember to set the generator’s maximum RF power level to a safe setting – typically an adjustable set point on the generator. If a manual matching network is used, it should be noted that the Reflected power may also vary however, as long as this level is safely within the generator’s tolerance window, the DC bias will still remain stable. What are the advantages and disadvantages of manually adjusted matching network tuning ? When an RF power system is used to power small to medium size substrate stages & platforms, the plasma discharge is typically stable, well behaved as well as presenting a constant impedance load. This means that the matching network settings will not need to be adjusted often. When multiple plasma process recipes are run, there may be slight changes to the plasma impedance resulting in different levels of reflected power. These variations are small and the user can choose to fine tune the match or if the reflected power is below 10% (of the forward power) do nothing at all. As RF power is applied to the substrate to ultimately create a DC “self” bias voltage, these reflected power variations do not typically result in much variation of the self bias. What type and length of coaxial cable is used to connect the RF System to the substrate stage ? The length “rule of thumb” is: shorter is better ! We have customers that successfully use up to 15 feet (4.6M) of cable. It should be noted that there will be some power loss with longer cable lengths. Small diameter (1>3″) substrate stages typically require under 50 watts of RF power so, the PB3-100 (rated at 100 watts) will provide sufficient power headroom to overcome the losses – and maintain the DC self bias level. Larger diameter stages may require more than 100 watts with the same headroom considerations to apply. Manitou also recommends dressing the “plasma” cable at least 4″ away from other control and electrical wiring inside the cabinet as there may be some “common mode” RF radiation along the outside of the cables shield. If this is a problem, we suggest that a cable with a Faraday shield be used as this cable type will choke off or attenuate any common mode RF current. Manitou can supply these and other cables – premade and ready to install. The match>substrate cable should always be a Teflon (not polyethylene) insulated cable as its more robust and survives RF current heating. The cable should also include a Faraday shield to minimize common mode RF currents that may cause RF interference to adjacent control cables. Verify that the coaxial RF vacuum feed through does not include any nichrome wire as nichrome will be lossy to the RF power, heat up and result in power loss. Click here for a link to the Using Coaxial adapters page. With and without a substrate on the stage’s surface. Order your system components here.